Acorn Child Care Center is family owned and operated. Juliana opened the center in the fall of 1991. Her two daughters Hillary and Carly both attended college and majored in Early Childhood and Psychology. They are both on site daily, usually working in a classroom. Carly is usually in infant/toddlers and Hillary is in preschool. We offer child care for ages 2 months to 8 years with programs for infants, toddlers, preschool and pre-K children. We provide age appropriate curriculum which supports individual growth in the areas of social, emotions, self-help, language, intellectual and physical development as well as independence, competence, originality, and self-expression. Our mission is to create a safe and nurturing environment that fully supports the needs of all the children, families, and teachers that comprise our Acorn Family! 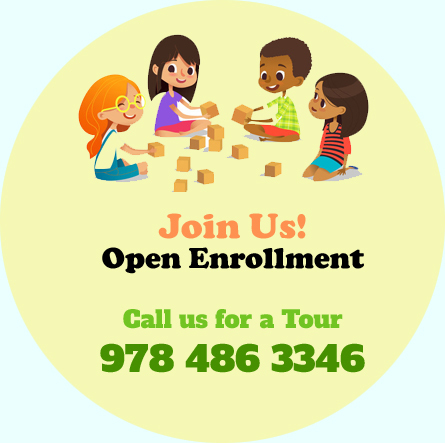 To start the enrollment process, we ask that you call to schedule an appointment to tour our center. We suggest that you and your child spend some time visiting his/her prospective classroom before making your final decision.